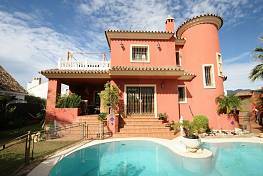 This is a real family beachside villa in Bahia de Marbella. 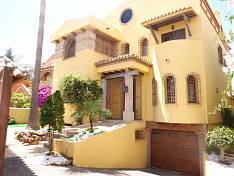 Within easy reach of everything, only in 200 mts to the beach (one of the best beaches of Marbella), 5 minutes drive to Marbella, 35 minutes drive to the Malaga Airport. 3 bedrooms, 4 bathrooms, built to high standard. It enjoys a large lounge with a fireplace leading out to garden and pool. Ground floor: 1 bedroom with bathroom, another full bathroom, fully equipped kitchen with direct entrance from the carport for two cars. Upstairs: master bedroom with en-suite bathroom , another bedroom with bathroom and a large sun terrace with beautiful sea views.